240 Beacon is located on the north side of Beacon, between Dartmouth and Exeter, with 236-238 Beacon to the east and 242 Beacon to the west. 240 Beacon was designed by Peabody and Stearns, architects, and built in 1871-1872 by I. and H. M. Harmon, builders, as the home of Edward Bangs, a lawyer, and his wife, Anne (Annie) Outram (Hodgkinson) Bangs. He is shown as the owner on the final building inspection report, dated October 17, 1872. They previously had lived in Watertown. They also maintained a home in Wareham. Edward Bangs purchased the land for 240 Beacon on November 23, 1871, from wholesale textile merchant Joshua Huntington Wolcott. He and his wife, Harriet (Frothingham) Wolcott, lived at 238 Beacon. J. Huntington Wolcott had purchased the land from the Boston and Roxbury Mill Corporation on October 20, 1863. Click here for an index to the deeds for 240 Beacon. On July 28, 1873, Edward Bangs transferred 240 Beacon into his wife’s name. The Bangs’s five children lived with them: Alice Bangs, Anne Outram Bangs, Charles Appleton Bangs, Outram Bangs, and Francis Russell Bangs. Alice Bangs married in June of 1881 to Robert Hallowell Gardiner, a lawyer; after their marriage, the lived in Chestnut Hill. Anne Bangs married in March of 1880 to Russell Sturgis, III, a medical student and later a physician; after their marriage, they lived at 31 Hereford. Outram Bangs married in November of 1892 to Elizabeth (Lizzie) A. Murray. They appear to have separated not long after, and he continued to live at 240 Beacon with his parents. Edward Bangs died in February of 1894. Annie Bangs continued to live at 240 Beacon with their three sons. Francis Bangs, a lawyer, married in December of 1897 to Anna Dummer Anderson; after their marriage, they moved briefly to 353 Commonwealth and then to 42 Fairfield. Annie Bangs died in November of 1905. Edward Bangs, a lawyer, moved to 553 Huntington. Outram Bangs, an ornithologist and Curator of Mammals at the Harvard Museum of Comparative Zoology, moved to 555 Huntington. On January 19, 1906, 240 Beacon was purchased from Annie Bangs’s estate by Katharine McLane (Tiffany) Abbott, the wife of Gordon Abbott. They previously had lived at 491 Commonwealth. They also maintained a home in West Manchester. Gordon Abbott was a banker with Old Colony Trust Company, joining the company as vice-president and retiring in the 1930s as chairman of the board. In June of 1927, Gordon Abbott acquired 242 Beacon. Gordon Abbott died in January of 1937. 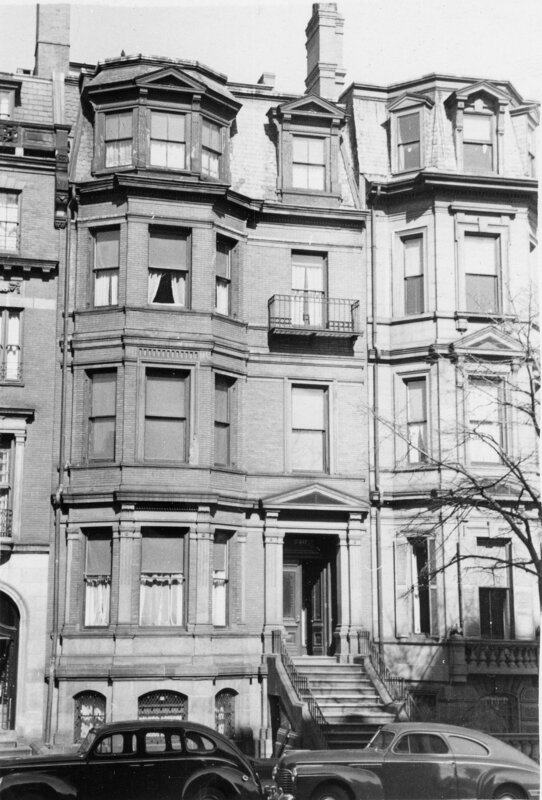 Katharine Abbott continued to live at 240 Beacon until about 1943. On June 9, 1944, 240 Beacon was acquired from Katharine Abbott by the Massachusetts School of Physiotherapy. That same month, it applied for (and subsequently received) permission to convert 240 Beacon from a dwelling into a school. The school remained there until 1957, by which time it had expanded to include a physiotherapy clinic. 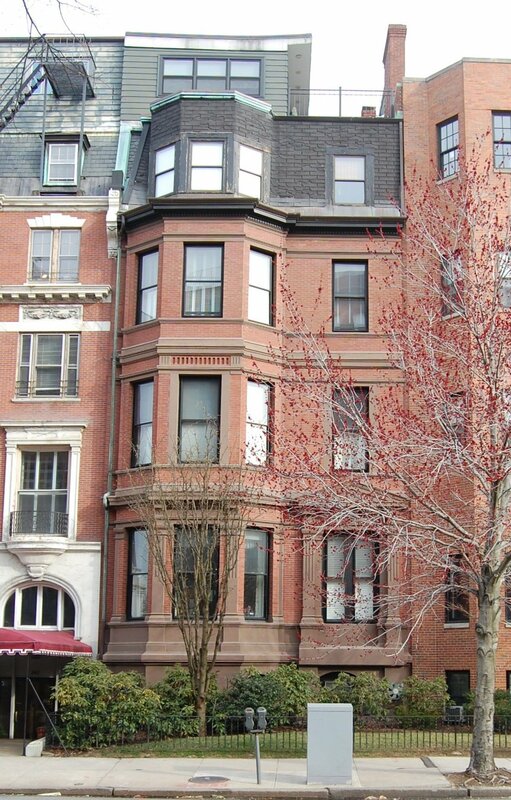 On March 7, 1958, Harold L. Levin, trustee, foreclosed on a mortgage given by the school and sold 240 Beacon to architect Saul E. Moffie, who also owned 236-238 Beacon, which he had remodeled into twenty apartments in 1950-1951. That same month, Saul Moffie applied for (and subsequently received) permission to convert 240 Beacon from a school into seven apartments. 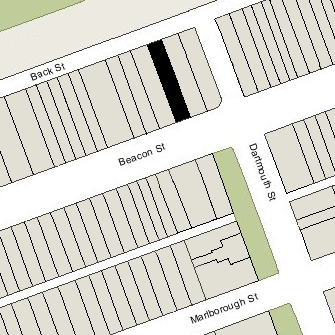 On the same day, he also applied for (and received) permission to cut doors between 236-238 and 240 Beacon, combining the three houses into one property and eliminating the entrance at 240 Beacon. It appears that it was at this time that mansard and dormers of 240 Beacon were modernized and a penthouse was added (or expanded) covering western two-thirds of the house. On December 7, 1971, 236-238-240 Beacon were acquired from Saul Moffie by real estate developer Elisha Russell (Greenhood) Greenwood, and June 9, 1972, they were acquired from him by Property Development Associates, Inc., of which he was the president.